How to Apply Filter in Decision Table? The size of a Decision Table may varies from a few rules to several thousand rules. While a small table is easy to read, a big table is not. To solve this problem, applying filter(s) on a Decision Table will be useful. A filter can assist you to screen out non-interested rule(s), so that you can focus on rule(s) that match(es) with a specific Conditions or Actions only. How to apply a filter? Click the Filter button on the right of the International flights column. Click the down arrow button. You can see the option <Variable> and Y.
Click Y. As a result, only those Action(s) that meet the Condition, International flights is/are appeared below. In this case, the Actions of International flights are shown and other Actions which are unrelated to International flights are screened out. In this way, the table becomes more user-friendly to read. Moreover, you can set multiple filters to more than one Conditions/ Actions. For example, other than International flights, if you want to buy the flight ticket for your child which is under 2 year-old. 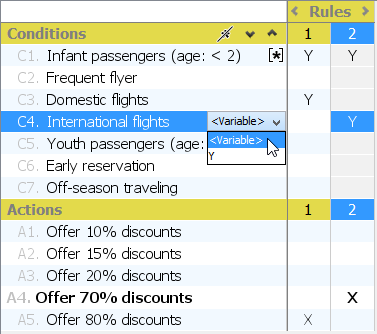 In this case, one more Condition needs to be fulfilled which is Infant passengers (age: <2). 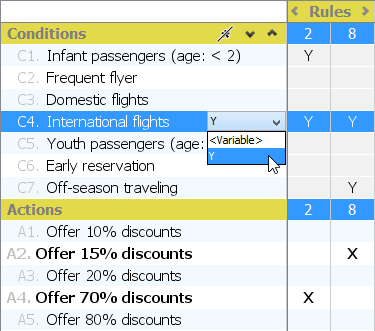 Then, you can set one more filter in the Infant passengers (age: <2) column. 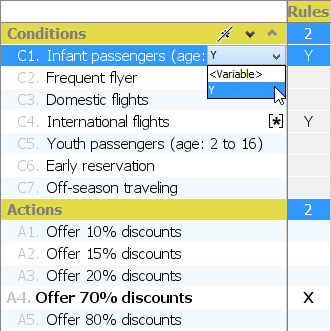 Consequently, only the Action, Offer 70% discounts is shown in the Actions column. In other words, only this Action satisfies the Conditions, International flights and Infant passengers (age: <2). Please note that except setting filters in Conditions column to look for Action(s), you can also set filters in Actions column to look for Conditions. How to clear all filters? 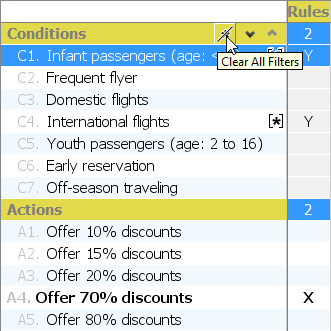 Select the Clear All Filters button near to the right of the Conditions column. The Decision Table will then be recovered. How to clear a single filter? Click <Variable> this time. Then, only the filter in the Conditions, International flights will be removed.